We often find ourselves drawing a mental divide between the strategic, data-driven projects that consume our weekdays and the various creative outlets that fill our evenings and weekends. Take your average Saturday for example—it's probably rare to find yourself segmenting the audiences of your next painting or studying the social media engagement rates on those photographs you posted from your hike. But what if we did start to think more about these activities through the lens of marketing? What similarities could we discover or lessons could we learn? When I'm not LMD'ing, much of my time is spent at band practice or live shows as a guitarist with Jackson Dean & the Outsiders. While country and southern rock concerts aren't typically what comes to mind when we think of marketing (although using music in marketing really matters), nearly everything about a live concert has an impact on an audience's perceptions of a band, growth, and engagement of its fans/followers, and the demand for new shows to be scheduled in the future—essentially everything we're after as marketers, no matter the industry, brand, or product. 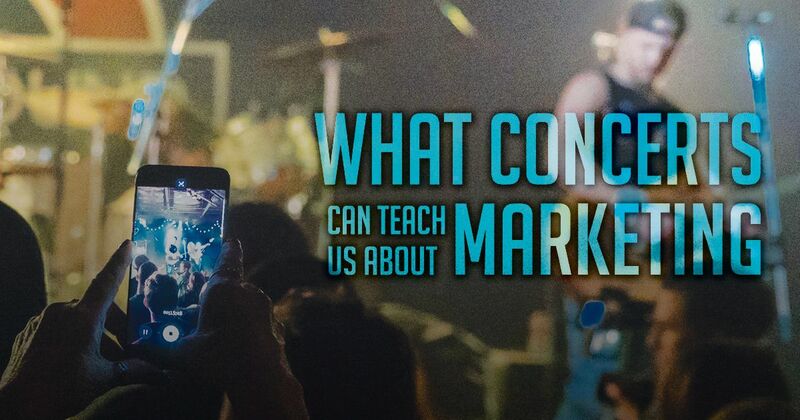 So what common elements of a band's live show resemble what we should be doing as marketers? Reimagine the best concert you've been to, but this time with a 5-minute break between each song where you watch as the band argues over which one to play next. The silence is broken with unrehearsed and sloppy performances, and the whole experience of a live show becomes choppy and stunted. That's the importance of a setlist, which in many ways is the Strategic Marketing Plan of a band's live performance. Proactively organizing your marketing efforts over the long-term to avoid lengthy gaps in outreach? Reaching your audiences consistently with high-quality content they enjoy and find valuable? Motivating your audiences to join in on conversations and create buzz, or are your messages purely one-directional? Creating channels or mechanisms for your audience to easily engage or connect with your brand, either online or in-person? Developing content that feels authentic and true to your brand, or does it seem forced and unemotional? Once a band has a setlist and can showcase great stage presence, it's the visuals and sound quality that seal the deal to make crowds want to capture and share the moment—a Snap sent out to a loved one, a Facebook Live video streamed to hundreds of followers, or even a simple "That show was awesome, you should go next time!" said to a close friend. But what if you couldn't hear the singer from 30 rows back? What if the stage was cast with a blinding light that made the show difficult to watch? Reaching audiences with a website that's responsive to display content effectively across all devices, especially mobile? Organizing website content with simple and intuitive navigation based on the needs of your audience? Accurately embodying your brand's characteristics through design, messaging, or audio? Creating positive user experiences that make people want to share it or talk about it? So the next time you're at a concert watching your favorite band (or Jackson Dean & the Outsiders) put on a show, try to spot all of the different ways they've created a positive user experience. Think about the planning, the execution, the content, and the ambiance, then try to make comparisons to the way your brand or organization is forming or executing its marketing strategy. Are their gaps? Areas for improvement? A #1 hit waiting to happen? At the end of the day, with each tactic working together in harmony, any band (or brand) is after the same goal: Encore!